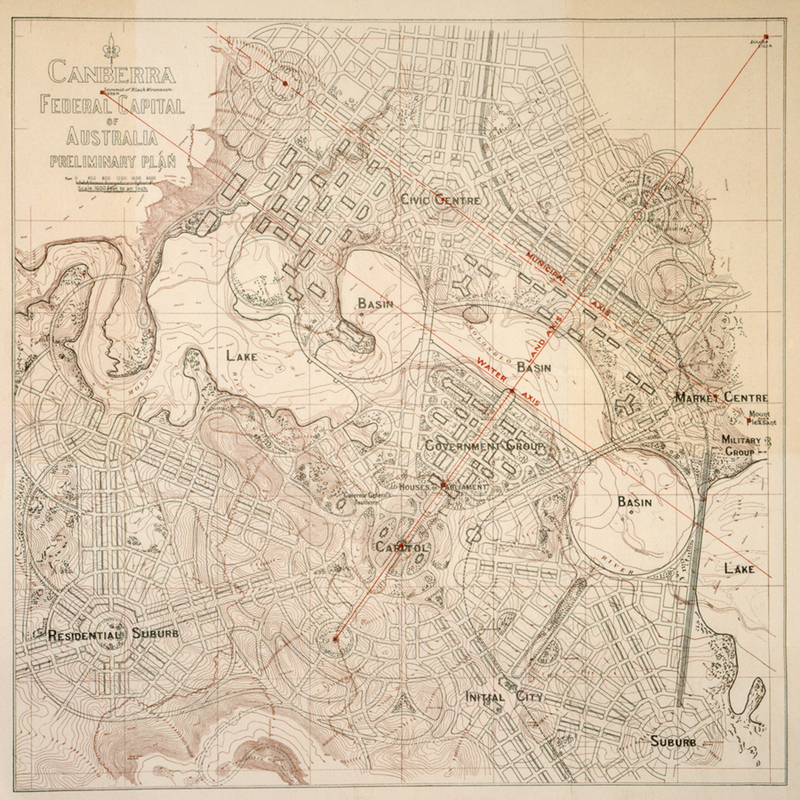 Yesterday, May 23, 2012, Australia’s federal capital city celebrated the centenary of the announcement that a Chicago couple, Walter Burley Griffin and Marion Lucy Mahony Griffin, had won the international competition to design Canberra. The Griffins beat 136 other entries and won the first prize of £1750. 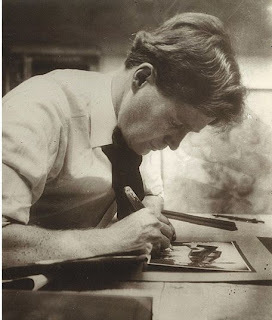 Strictly speaking, Walter Burley Griffin, after whom Canberra's lake is named, was the declared winner, but quite clearly his wife, Marion Lucy Mahony Griffin, had an awful lot to do with his entry winning. 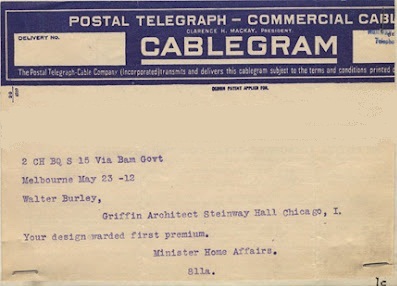 The 100th anniversary of this event was marked by the unveiling of a long-lost (and presumed destroyed) document, the Griffins’s typewritten manifesto of their vision for this man-made city. It was described by Australian Capital Territory Chief Minister Katy Gallagher as ‘‘a fragment of Canberra’s birth certificate’’. The 29 typewritten pages reveal the Griffins’ rush to get the booklet to Australia before entries closed. Toward the end of the document, typed words have been erased, changes made in pencil, and there are spelling errors. But the Griffins’ unseemly haste to get the manifesto completed in time is understandable. Marion Lucy Mahony married Walter Burley Griffin in Michigan City, Indiana, on June 29, 1911, and the couple were on their honeymoon when, in July, they learned of the competition to design Canberra. The competition had been announced on April 30, 1911, and entries were to be in Australia by January 31, 1912. As it transpired, the deadline was later extended to mid-February, after the Australian government learned entries were on their way from overseas. Nonetheless, the Griffins were described as having compiled Walter’s designs, Marion’s eerily prophetic drawings of what the city would become, and their typewritten documents “in a frenzy”. 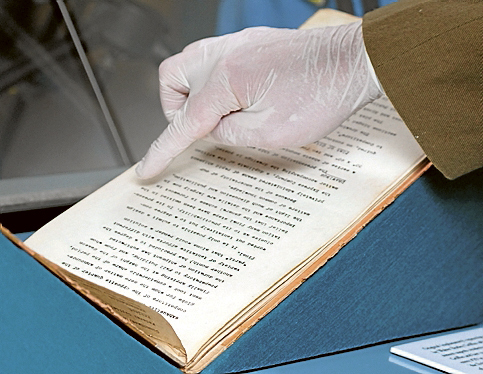 Canberra centenary history and heritage adviser David Headon unearthed the typewritten manifesto buried deep in a container of papers held in the Planning Institute of Australia’s storage units in Fyshwick. 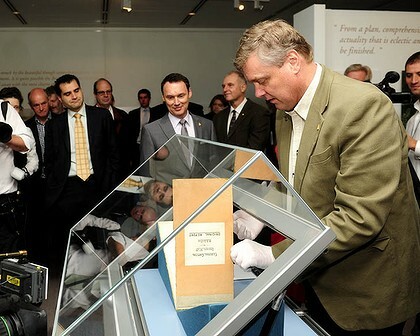 It is now in an exhibition at the federal Parliament House in Canberra and will later be kept in the National Archives of Australia. Apparently the document had been disassembled so that city builders could refer to various parts of it when the construction of Canberra started in 1913. The contents were also copied, corrected and printed. But it seems the original typewritten pages were later put back together in the Griffins’ format, and the manifesto promptly stored away – not to be seen again until earlier this year. Canberra will celebrate its centenary next year. It was officially named on March 12, 1913. Walter Burley Griffin was born on November 24, 1876, at Maywood, near Chicago. He died of peritonitis on February 11, 1937, in Lucknow, India. From 1901-06 he was an associate of Frank Lloyd Wright at Oak Park. Marion Lucy Mahony Griffin was born in Chicago on February 14, 1871. She died in the Cook County Hospital, Chicago, on August 10, 1961. In 1895 Mahony was the first employee hired by Frank Lloyd Wright. Belated Birthday wishes Canberra! The quote about the Birth Certificate raised a smile. It would make a heck of a typecast!